Beautifully written, Emily. To read your unbelievably accurate account of the emotional roller coaster we all find ourselves riding was so powerful for me. When things hurt this much, it’s pretty easy to feel alone. Thank you for reminding me that there is a collective soul among passionate music lovers and we can help lift each other up during this nightmare. Emily, you no doubt know the quote of Mr. Rogers that went viral after the Sandy Hook shooting: “When I was a boy and I would see scary things in the news, my mother would say to me, ‘Look for the helpers. You will always find people who are helping.’ ” I’m not comparing the Sandy Hook event to the orchestra lockouts. But I will say that for those of us for whom the SCPO and MO provided sustenance for the soul; hope in a murky world; child-like wonder at the co-creations of women, men and God; inspiration to be our own best selves — this saga has been deeply spiritually painful and disillusioning. But then there was Emily, a young woman who provided a gathering place for people who hurt and felt virtually powerless. You have been an extraordinary helper. And aside from your fiery determination, you have given us such beautiful, beautiful writing, almost a kind of music in itself. I wish you well in every way. May all your dreams come true. do you have a relative named Charles Wendt, cellist? I knew him a thousand years ago I think at the University of Iowa. Are you a musician yourself? Hi Stephanie. I am a pianist, but fifth-generation Australian. Lived in the Minneapolis a long time, now in Sweden. Would love to have a relative who played the cello! Wendt is not such a common name, so perhaps there’s a connection way back. … and a former on-air “personality” at Minnesota Public Radio, if I’m not mistaken! I hope you are doing well in Sweden. We miss your lovely voice and knowledge of music. Beautifully written. Made me cry. Hope you get your orchestra back and that they fire the sociopaths who are hellbent on its destruction, and glad you like Bruckner now. This made me cry, as I have when hearing one of the musicians’ concerts in this terrible non-season. Emily, your eloquence is beyond anything I can add. That said, the MOA’s administration should be taken out back and hung from the nearest lamppost. A wonderful and heart-felt review. Thank you so much. It reinforces what I’ve been telling my friends for months about the lockout concerts. They tell me I get a little gushy about them, but it’s what I feel–and it is also the truth, and it needs to be told. The Minnesota is not an orchestra that quickly falls apart in difficult times, and it has never been fueled by a few star players and star guest conductors. No, the Minnesota is a mighty ensemble, and while it may have lost some of its best players, the loss serves to highlight its depth. And what depth it has! What I have been hearing at the lockout concerts has not been some damaged orchestra still flying with buckshot in its wings. No. I have been hearing a first-class, world-class, top drawer orchestra at the very height of its powers. 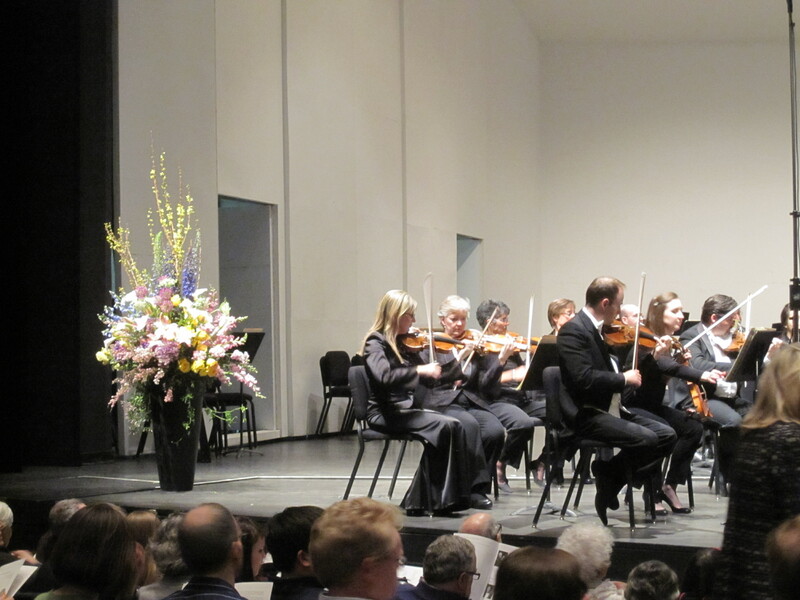 And about last Thursday–need it be said, the Bruckner 4 is not a walk in the park. It calls for everything an orchestra has to offer: horns and brass, percussion, woodwinds and strings–and especially for one of the inner voices of the strings–yes, the violas. Finally, the Bruckner 4 calls for a deep sense of ensemble. The Minnesota has the ensemble characteristics of a fine string quartet. It has it all. Our orchestra, the Minnesota, is a magnificent and mighty ensemble. It remains so to this very day. Beautiful article! It is sad to see that the arts organizations are being run by people who knows nothing about the arts and who don’t care one bit about the arts. If orchestra musicians can be replaced by any random players, we may as well replace the CEO with a random child selling lemonade on the street side. He/she might do a better job. Emily, your writing is so wonderfully moving, as though listening to the very concert itself. Thank you, thank you! Yes these are beautiful sentiments all. But they are directed at the chorus. The majority of American society outside our nice bubble has no clue about either classical music or that we are even paid at all. Believe me, go out in the world and ask people at WalMart, medical offices, schools, any occupation really, if they like classical music, ever listen to it, or have attended a concert not comped. The overwhelming answer will be NO. This reply represents the AVERAGE American – those who do not contribute but those who have resigned themselves to be ruled by CEOs, banks and the in-your-face “popular” culture vomited out by TV, movies and radio. Even those who can appreciate the finer arts are surprised to find out that they have to vote with their money and attendance. True. But Minnesota has voted with our money already, even without the knowledge our orchestra was apparently dying. That’s why we have a brand new $50 million lobby and a $150-$200 million endowment that has been built over the last century. And Michael Henson has deliberately crafted a business model in which attendance drops, in order to control costs. He has also presided over a 25%+ drop in the marketing budget. If there’s an orchestra management that misleads the public about its finances, is not fighting to increase attendance, and slashes the marketing budget, then we have a problem. And I’m going to preach about that problem. And if the chorus is the only one who hears (likely, thanks to the echo chamber that is the Internet), then so be it. This “lockout” of the great Minnesota Orchestra leaves all us orchestral musicians dreading what other stupid move management will make in the future, and wanting a resolution sooner rather than later. I really feel that Mr. Henson should be driven out of North America for good, and never let inside a concert hall again. Thank you for this; printing it out for a proper long read. Beautiful, heart-felt writing. Thank you for sharing and for all of your work on behalf of the maintenance of world-class classical music in Minnesota. We need classical music to lift our souls and to help us transcend the challenges in the world around us. This lockout has shown me how it extraordinarily important it is for me to do my part to help sustain our classical music institutions, and I hope that it has inspired others to do more as well. And now I read on Slipped Disc that Burt is leaving . . . Absolutely mind-blowing, what they’ve done. What is the fiscally and musically viable solution to the problem–specifically? – Michael Henson needs to go. Period. Patrons don’t trust him; musicians don’t trust him; the state legislature doesn’t trust him. – Musicians must be allowed to have a greater say in decisions that will affect the artistic future of the organization. – Management must submit to a financial analysis that includes examinations of the effectiveness of the board. – Certain individuals need to answer outstanding questions (why did the Minnesota Orchestra endowment lose so much compared to other arts organizations in the recession in 2009? how many players would they need to lose before they start feeling uncomfortable? how do they expect to build a successful organization while the state legislature investigates them for mis-use of funds? why were marketing budgets slashed? who thought it was okay to tell the Minnesota legislature that they were facing the fiscal future with stability, when they were actually, according to Jon Campbell, preparing for a “business model reset” and very possibly a work stoppage in 2009? what benefits are there to hurting the local sub and professional musician market by having musicians play in the background at private events? and I could go on and on AND ON). – Management must reach out to patron stakeholders, and reward them for getting involved and making their voices heard. – The new new business model needs to include wayyyy more outreach to students and young people. Like, wayyyyyy more. Look at what Cleveland is doing. Their increasing revenues are due largely to an influx of students. The management of the Minnesota Orchestra is quite frankly terrible at reaching out to young people. There’s a huge untapped pool of brains and ears there. – The management needs to harness the power of the public, rather than trying to work against them. Once all – or even some – of those things are in place, maybe we can get to a place where trust is rebuilt and work on a new, truly artistically and financially sustainable plan for the future. But as it is, we can’t even agree on the fundamental nature of reality. That’s a problem. What good is an orchestra – an organization tasked with serving the public – if its most passionate fans are shut out of the discussion? i find Chuck Graham’s question interesting. the fact remains: big money does what big money wants and there is NO retribution or justice in this country. in Iceland the “banksters” were ALL imprisoned and the folly-ticians were STONED in the street (biblically). that’s a good start. the board of all of these organizations should be run equally by musicians from the orchestra with CONTROLLING interest and an ear to those that pay for the tickets. not a bunch of money buggering schmucks who only care about lining their own pockets and a bottom line. one might also note that music and art are always the first cut from programs in school systems – and proven over and over again (scientically, medically et cetera) to have profound effects on learning and intellectual capacity. so… starve the people of music (and by music, let me be clear i mean CLASSICAL MUSIC) then we have a dumb populace. compared to Europe where there are local symphonies and opera companies, we ameriKKans are fat lazy and dumb. the 0.01% has brought its plan to fruition. a truly dumb nation. i’m not sure if you play like you write… but these words you’ve written have assaulted my senses – in the very best of ways. i am enraged and deeply saddened. it was as though i was standing or sitting next to you every moment you described. i am a juilliard trained musician and was sent your blog entry by a long time friend that is also of that fine institution. i am appalled at the corporate fascism that has overtaken this nation. and only hope that the fire from this orchestra and audience awakens the “fat dumb lazy” americans that have given themselves over to this fascism. thank you for your graceful fantastic post. I posted this to the MOA Facebook page on 10/23/2012, and it seems to have disappeared now. As to the present situation, it was predicted to me a year ago by several former colleagues in the orchestra. To say the least at this point, I am disgusted at where this has gone. As to comments above, I agree and disagree, depending, but in general the arts and sciences, particularly music, are the drivers of our civilization and they are what makes us “human” at all levels. Fie upon Henson and the rest of the greedy, corporate types who now are in control of the MOA for their disgusting and stupid behavior. The world is not built on finance, alone. I wish I could have been there playing Bruckner again with Stan. But, at this point, RIP: Minneapolis Symphony – Minnesota Orchestra. I think Bruckner’s music is a kind of “Headbanging” music. Some of it is “Death Metal” stuff. Some Scherzos are “slasher” material. They can be good music; but horrifyingly. I am sometimes frightened even more by the audience’s reaction to such music. It seems like the louder the brass the louder the audience’s response. Such music definitely have power to whip up an audience.